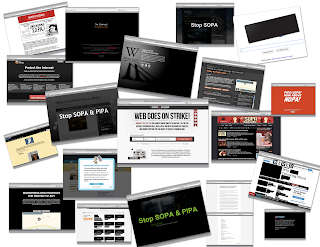 Maybe some of you noticed that yesterday (January 18) this blog joined the blackout against Stop Online Piracy Act (SOPA) and Protect IP Act (PIPA), among sites like Reddit, Wikipedia, Google, Mozilla and ICanHasCheezburger. As a writer I care about copyright. I think all creative people who are trying to make a living out of artistic work care about it. But we also care about free speech and free knowledge. SOPA and PIPA (aswell as ACTA, Mexico's Döring Law and any other legislation that censors and controls knowledge) are not about copyright protection, they're about control —as Chuck Wending said—, they're a threat to people and freedom. We, as individuals, elected legislators. Lets ask them —demand them— to protect people, not big corporations. Do we want an Orwellian world in which everything we can read, watch or listen is controlled? Internet is the last bastion of freedom and I want to help to protect it as much as I want to create art and make a living out of it. Author Chuck Wending, The Oatmeal's Mathew Inman and this open letter signed by some artists said it better than me. Go read them. So educate yourself. Think about it. And speak up before the Internet —as we know it— dies. Do it for the kitties. Do it for the LOLcats. Want to know more? Visit Stop American Censorship.